Also known as water lens or bayroot, duckweeds are aquatic flowering plants that either float on top or just below the surface of still waters. They are members of the aroid family and are classified as Lemnoideae. According to the classification adopted at the close of the 20th century, duckweeds were scientifically named Lemnaceae. Duckweed is a simple plant with stems that are not very obvious in appearance. The larger part of the plant is in the shape of a frond that measures a few cells thick. It also has air pockets referred to as aerenchyma that allow it to float on water. The presence or absence of roots depends on the particular species under observation. Some varieties have no roots while others have rootlets. This plant reproduces through asexual budding. This budding occurs at a meristem that is usually located at the base of the frond. Three tiny flowers comprising a pistil and two stamens occur and this is the system that allows sexual reproduction. 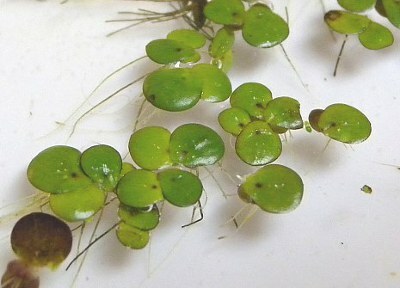 The duckweed genus Wolffia has the smallest flowers known which measure about 0.3mm in length. The fruit produced through the sexual reproduction process is a utricle and the resulting seed is contained in a sac with air for buoyancy during floatation. Distribution of duckweeds just like that of other wetlands and aquatic plants is influenced by the availability of nutrients. It is common to find duckweeds in fertile and eutrophic conditions. They can also be spread through agents such as small mammals and water fowls. Small currents and overflows usually carry these plants down the channel to another location. Duckweeds are found in many places around the world and particularly in South East Asia. Here the plant is eaten as a source of high-protein. Some aquatic lives also use this plant both as shelter and food thereby making it accomplish two roles in one.